Chapultepec Lupita: No flan for you! Chapultepec Lupita serves up great margaritas, great salsa, great food and great atmosphere. Just don’t ask for any dessert. Tex-mex restaurants are to Houston what Ray’s Pizzerias are to NYC–seems like there’s one on every corner. 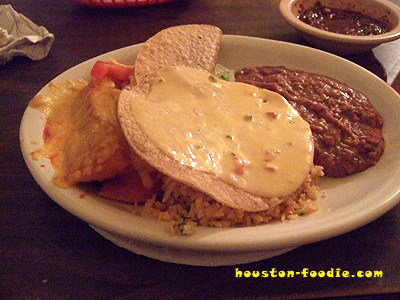 So how does the typical Houston tex-mex restaurant differentiate itself from the competition? In the case of Chapultepec Lupita on Richmond Avenue in Montrose, the food is fresh and attentively prepared, the variety of tequilas is plentiful, the salsa is homemade, and the staff greet regulars with hugs and kisses (seriously). And did I mention it’s open 24 HOURS? On a recent Tuesday evening the restaurant was about half full. As i stretched out in a booth, the server–friendly and smiling Ines–arrived immediately with the menu and I immediately ordered a Margarita. Ines recommended the happy hour special: the Charro Rita made with El Charro Silver Tequila and La Grand Marsalle liqueur. It was excellent. Chips and salsa arrived next. One of the best ways for a tex-mex restaurant to differentiate itself is to serve fresh salsa. Middling tex-mex restaurants might underachieve and serve Sysco salsa, or overachieve with some kind of crazy pineapple salsa. This salsa was fresh and good. Like all great salsa, the base flavor eminated from the freshly chopped tomatoes, followed by a layer of cilantro, onions and jalapeno peppers. Sippin’ my maggie and munchin’ on the chips and salsa started to raise my expectations for Chapultepec Lupita. The main course was the Chapultepec Special: Shredded chicken enchilada, beef tamale, ground beef crispy taco, queso chip, rice and beans. When the plate arrived, a couple of things portended a special experience–the giant queso super chip and the screaming-hot plate. So hot that the main plate sat on a stack of about 15 paper plates (presumably so as not to burn the lovely Ines), and so hot that the overflowing enchilada cheese was crusted and bubbly along the edge of the plate. I’ve had queso chips before, but this monster covered half the plate, was perfectly crisp and crunchy, and the thin layer of queso was smooth and spicy. The highlight of the dish was definitely the chicken enchilada. The shredded chicken was moist, tender and well-marinated, wrapped with tortilla and cheese that acted as a worthy complement. The tamale was 80% masa and 20% beef, but that was OK–the masa was smoky and moist with a silky/buttery texture. The beef was almost an afterthought but added just enough zing to counter the earthy masa. The rest of the dish was serviceable. The taco part of the crispy beef taco was crisp and fresh like the queso chip, but the ground beef was somewhat flavorless. The rice and beans were standard-issue–but again, better prepared than most and completely enjoyable. Impressed so far, I thought I’d go for the hat-trick and try the homemade flan for dessert. And that’s where the problems started. Read on. Service was great until the dessert course. Normally I wouldn’t get a dessert but the food up to that point was so good, I had to try the prominently displayed homemade flan. I placed the order with Ines and waited expectantly. Ines returned with a sheepish grin and some bad news. No flan for you! They had not made any flan for the day. Maybe dessert courses aren’t very popular on Tuesday night? They did have New York Cheesecake, but I passed. Located in an old house in Montrose, dining rooms are scattered throughout the house with an enclosed patio tacked on to the front. Pictures of Lupita along the walls and neon shrines to the Virgin Mary add to the quirky atmosphere. The jukebox played (not too loudly) groovy 70’s tunes. The eclectic crowd on this Tuesday night reflected the Montrose neighborhood. The table next to me was a young family, with the older child maybe 11 or 12, sporting a fabulous mop of dreadlocks. I knew that made him either the most popular kid in school or the biggest outcast. It didn’t take long to figure out which. “Everbody hates me!” the child tearfully mumbled. The dad was having none of it. “We don’t hate you! Stop whining and start talking!” Conversation ensued and the child was mollified. After the food arrived the table became curiously quiet. The value is excellent. Chips and salsa, Margarita, and a big plate of food for $16 drive-out. There were a few main courses in the $15 range–steaks and fajitas and such–but if you stick to the tex-mex basics there are few better deals out there. Chapultepec Lupita offers fresh, inspired, and attentively prepared tex-mex food at reasonable prices in a comfortable and friendly atmosphere. And it’s open 24/7. This entry was posted in Blog Only, Food, Restaurant Reviews and tagged 24/7, chapultepec, flan, margarita, montrose, tex-mex. Bookmark the permalink.